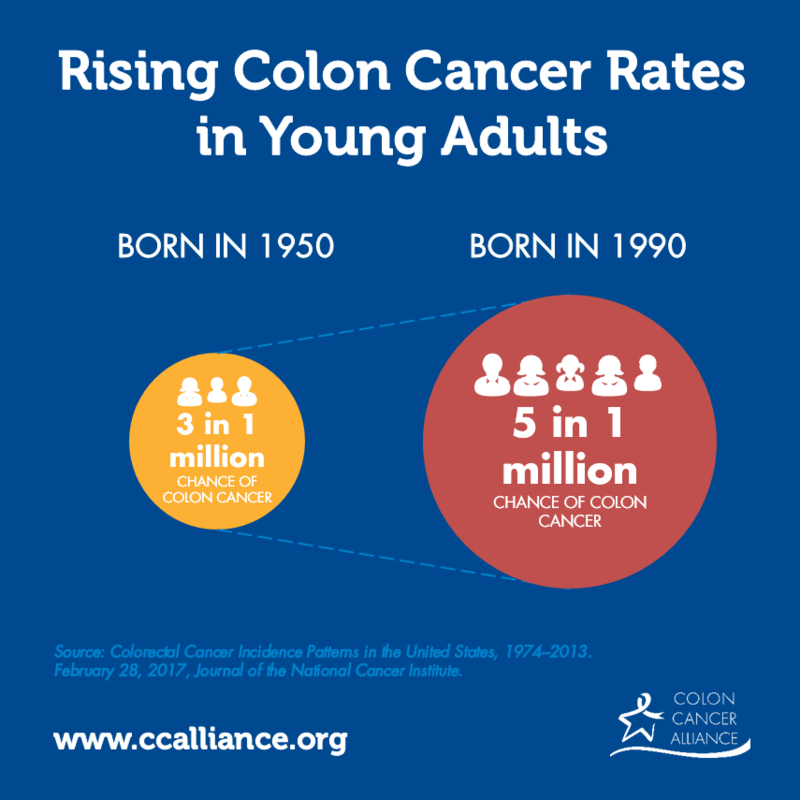 The incidence of colorectal cancer (CRC) continues to steadily decline for older adults, while it steeply rises in younger adults. In fact, those born around 1990 have double the risk of colon cancer and quadruple the risk of rectal cancer compared to people born in the 1950s, according to a recent study published in the Journal of the National Cancer Institute. Using information from the Surveillance, Epidemiology and End Results (SEER) database, researchers from the American Cancer Society evaluated 490,305 patients over the age of 20, diagnosed with colorectal cancer between 1974 and 2013. They examined trends in population-based CRC occurrence by tumor location, age at diagnosis and year of birth. They found that while colon cancer incidence rates decreased in previous records, for patients aged 20 to 39 the rate has increased by 1 percent to 2.4 percent annually, since the mid-1980s. Rectal cancer incidence rates have been increasing 3.2 percent annually from 1974 to 2013 in patients aged 20 to 29. Furthermore, during the late 1970s and early 1980s, CRC incidence rates declined in age groups younger than 50 and increased in those aged 50 and older. However, in the mid 1980s through 2013, the rates of adults aged 55 and above decreased, while the rates increased by 2.4 percent each year for patients aged 20 to 29, and by 1 percent each year for patients aged 30 to 39. The trends in rectal cancer are more prolonged for all age groups, although the rise in young adults is steeper. The authors noted that age-specific CRC risk of those born around 1990 has escalated back to the level of those born around 1890.They suggest that these trends represent changes in exposure to risk factors such as excess body weight, high consumption of processed meat and alcohol, low levels of physical activity, low levels of fiber consumption and cigarette smoking. There has been a parallel rise of the obesity epidemic, which shares behaviors that independently increase CRC risk. Additionally, a study has shown that a Western-style, high-fat, low-fiber diet initiates inflammation and proliferation in the colonic mucosa — where nutrients, fats and proteins are absorbed from the foods we eat — within two weeks. While detection of preclinical disease could be because of rising colonoscopy utilization, rates have risen at a similar magnitude for both early- and advanced-stage diseases which is inconsistent with a screening effect. The results of this study highlight a need for increased awareness among clinicians and the general public. A younger adult with CRC could be at risk of a delayed diagnosis, as many clinicians do not expect to see this diagnosis in such a young patient. Current guidelines recommend that screening begin at age 50 for men and women of average risk for developing CRC, and earlier for those at an increased risk. While colonoscopy prevalence has increased in the past 10 years, authors suggest “adherence to the guideline-recommended screening initiation should be emphasized.” Additionally, they suggest efforts to be made for screening to be done prior to age 50. Aside from screening, there are ways to lower the risk of developing CRC, such as maintaining a healthy weight, changing diet and increasing physical activity. Ultimately, further research must be done to discover that cause and then implement preventions against and treatments for it.